Now that fall is officially here for us in Montana, my cravings for all things pumpkin have returned! Accompanied by more cravings for all of the warm and flavorful spices (cinnamon, nutmeg, ginger, cloves!) that compliment pumpkin oh so well. 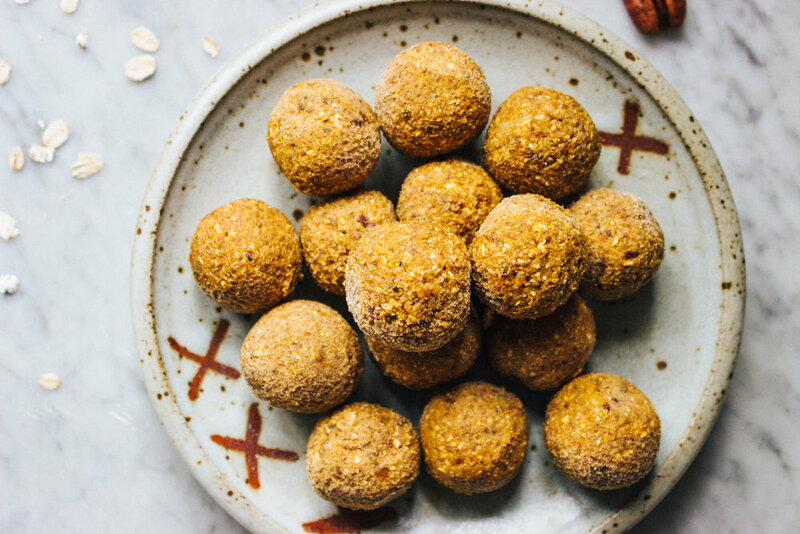 I love coming up with new ways to get my pumpkin fix, and one of the simplest ways I have found is in the form of these Pumpkin Spice Energy Bites! I’m all about healthy snacks and sweet treats and these bites are no exception. Made up of decadent dates, creamy pumpkin puree, raw pecans, gluten-free oats, hemp seeds, cinnamon and pumpkin spice, it truly doesn’t get much easier or taste more like fall than this. 2. Using a spoon, scoop and roll mixture using your hands into small balls (about 1 inch or so in size). 3. Store in an airtight container in the fridge for up to 1-2 weeks (or longer if kept in freezer...my preferred choice)!